The diagnostic large ear, or tympanic membrane, is really an exposed eardrum, tuned to match the low-pitched frequencies (100–200 Hertz [Hz, or cycles per second]) of the male’s call with an upper limit of 4,000 Hz. In comparison a young human can detect sound from 20 to 20,000 Hz. This largest and most sonorous of North American frogs, Rana catesbeiana, is easily located when males are calling jug-o-rum during mating season in summer. It is a predator of anything it can swallow including arthropods, worms, snails, crustaceans and small birds. Its adaptable diet includes other bullfrogs and other frog species, a problem in the western U.S. where introduced bullfrogs threaten populations of endemic frogs, many of which are endangered. 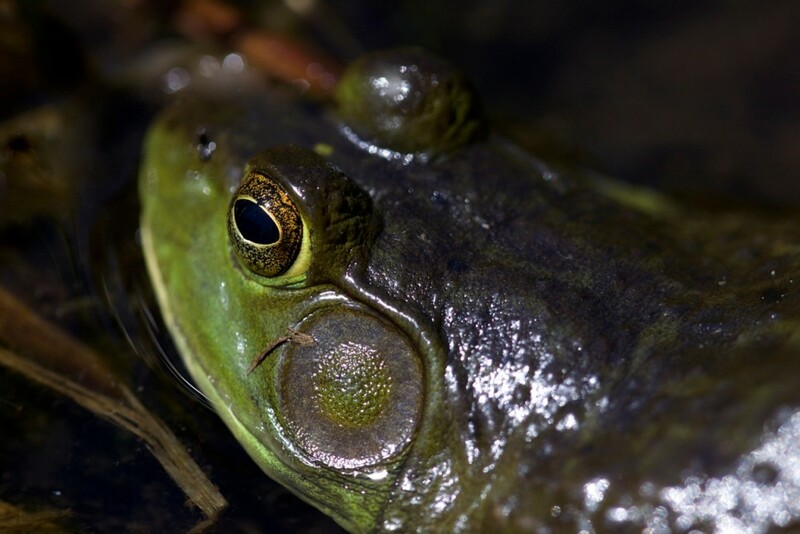 The bullfrog in turn is food for raccoons, herons, foxes and other animals. Its palatability to humans has helped spread it westward beyond its original range in the eastern U.S. and to Europe and Asia. Tadpoles, over-wintering in the mud of pond bottoms, take two or three years to change from their initially legless and tailed larval form to tailless adults. Like adults, tadpoles are larger than other species and can be seen grazing on algae in the shallows. “Bullfrogs In The Backwater” is taken from Best Nature Sites: Midcoast Maine, a collaboration between writer and photographer Tony Oppersdorff and writer and editor Kyril Schabert.